Impressive power and features from a versatile combo you can take anywhere. 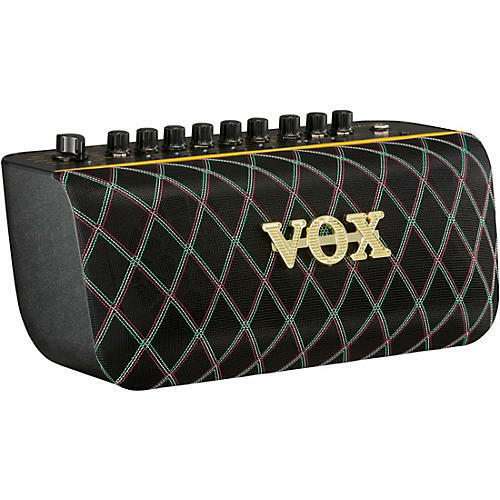 The VOX Adio Air GT is the ultimate practice, recording, and performing solution for the modern guitarist. With a full complement of impressive amp models and expertly voiced effects, the Adio Air GT is capable of reproducing all of your favorite guitar sounds from classic cleans, to the iconic crunch of an AC30, all the way to high-gain overdrives. Beyond being an incredible 50-watt amplifier, the Adio Air GT features two 3 in. stereo speakers and a uniquely designed cabinet to provide an immersive listening experience when paired with your smartphone, tablet or other music playback device. The Adio Air GT also features Bluetooth MIDI connectivity, allowing you to control your amplifier wirelessly from your favorite device. With additional features like USB output, Aux in, and battery power, the Adio Air GT is the perfect take anywhere, do-anything guitar amp. The total of 11 built-in amp models includes VOX's legendary AC30 as well as a variety of high-gain and clean amps. The models have been carefully tuned to take full advantage of the compact Adio's potential, so that all of them are truly usable high-quality amp models. By using the Tone Room software, you can choose from a total of 23 types of amp models. With just this single unit, you can enjoy a variety of amp sounds ranging from classic vintage amps to costly boutique amps. ​A full complement of effects is also provided: four modulation-type effects, such as chorus and tremolo (FX1) and four ambience-type effects, such as delay and reverb (FX2), are built in. Appropriately for the Adio with its stereo speakers, it is also equipped with high-quality stereo effects, and you can simultaneously use a total of three effects including noise reduction. As with the amp models, using the Tone Room software lets you choose from a total of 19 types of effect: 11 for FX1 and 8 for FX2. A noise-reduction function is provided to reduce unwanted noise when using high-gain sounds. This can be adjusted in five steps. Since JamVOX III modeling software is bundled, you can easily enjoy playing guitar on your PC. You can take advantage of the GXT function that lets you cancel or extract/emphasize a specific part from an existing song; you can also use the music player function to play back a loop from a song that you're learning or practicing, and even change its tempo. ASIO drivers are supported, so you can also record and play back via software other than JamVOX III, such as a DAW or guitar amp simulator.